With natural extracts of henna and chamomile. 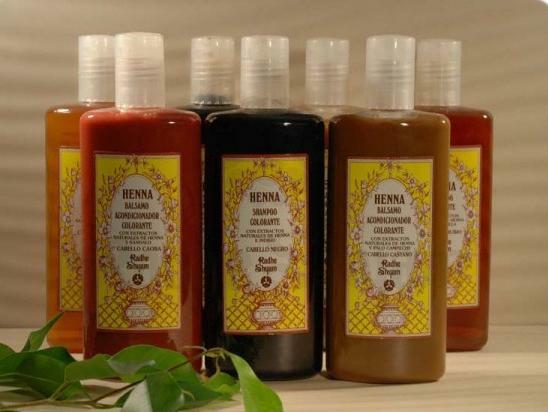 Henna conditioner was developed to strengthen the action of the color after color application, thereby increasing its effect. With natural extracts of henna and chamomile to fortify the shade of your hair. Enriched with karite butter and olive oil from organic farming, to give your hair an incomparable shine and softness. Does not contain parabens, mineral oils, silicone or phthalates, synthetic dyes or alergens. Ingredients: Aqua, Glycerin, Cetearyl Alcohol, 1.3-Propanediol, Dicocoylethyl Hydroxyethylmonium Chloride, Butyrospermum Parkii*, Cetyl Alcohol, Cetearyl Glucoside, Olea Europea Fruit Oil*, Ethyl Lauroyl Arginate HCl, Hydroxyethycellulose, Parfum, Rheum Undulatum Extract,Citric Acid, Panthenol, Sodium Hydroxide, Chamomilla Recutita Flower Extract*, Triticum Vulgare Germ Extract, Lawsonia Inermis (henna) Leaf Extract, Sodium Benzoate, Potassium Sorbate. Suggested use: after washing the hair with the coloring shampoo, apply a sufficient amount of the coloring conditioner, gently rubbing from the root to the tips. Let it act for 2-3 minutes and wash with water. For a better result we recommend the use of coloring shampoo and conditioner adequate to your hair color. In case of contact with eyes rinse with clean water immediatly. Keep out of the reach of children. Product not tested on animals. Recyclable packaging. With natural extracts of henna and logwood.